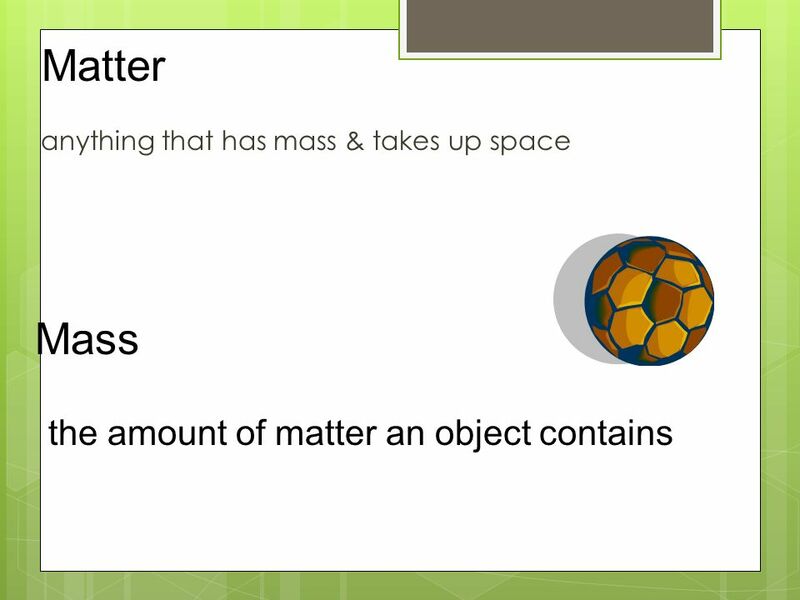 Anything that has mass & takes up space Matter Mass the amount of matter an object contains. 2 States of Matter  Solid –  definite shape  definite volume  Particles of a solid are packed close together and the motion seems to be a vibration. 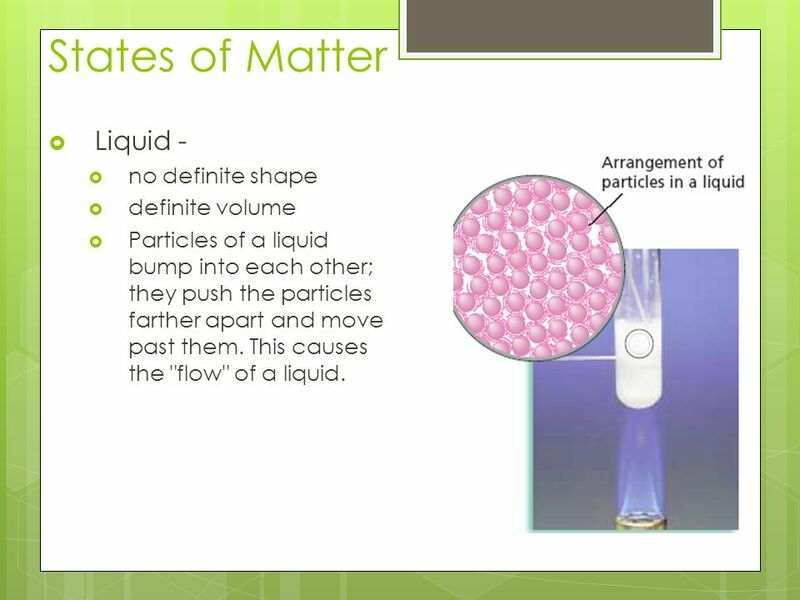 3 States of Matter  Liquid -  no definite shape  definite volume  Particles of a liquid bump into each other; they push the particles farther apart and move past them. This causes the "flow" of a liquid. 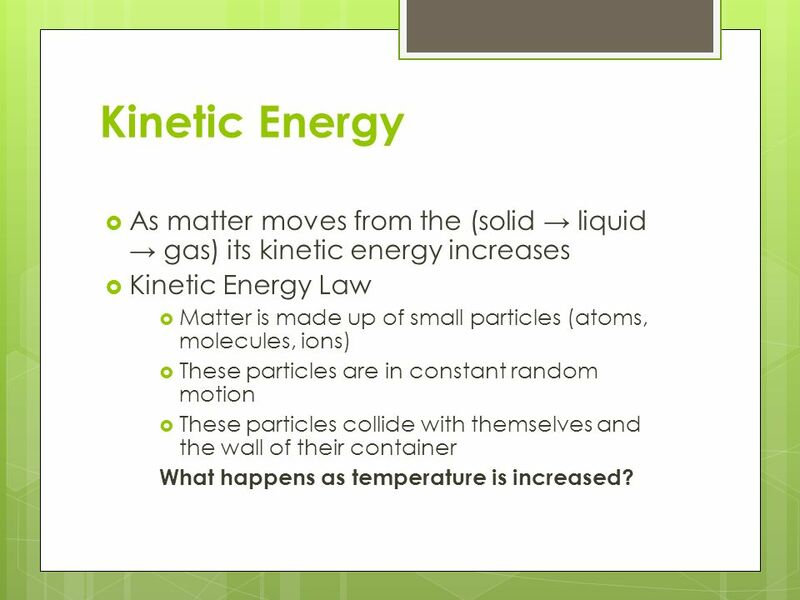 8 Kinetic Energy  As matter moves from the (solid → liquid → gas) its kinetic energy increases  Kinetic Energy Law  Matter is made up of small particles (atoms, molecules, ions)  These particles are in constant random motion  These particles collide with themselves and the wall of their container What happens as temperature is increased? 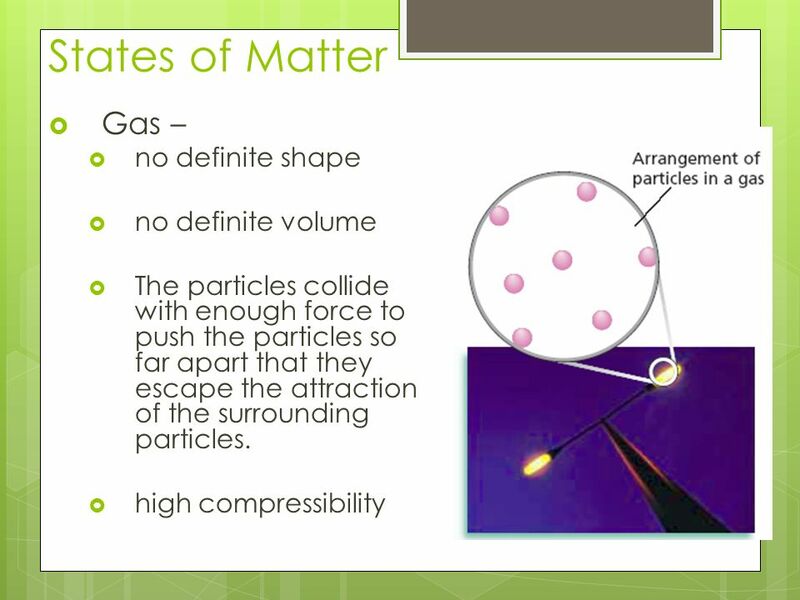 Download ppt "Anything that has mass & takes up space Matter Mass the amount of matter an object contains." 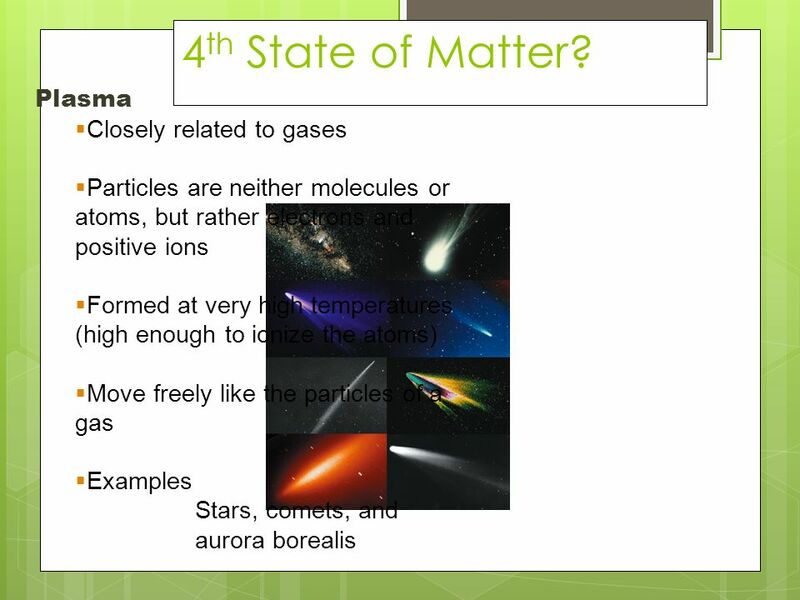 States of Matter. First, what do we know about matter already? What are the three common states of matter? Solid, plasma, liquid Liquid, Gas, Plasma Solid, Liquid, Gas None of the above. 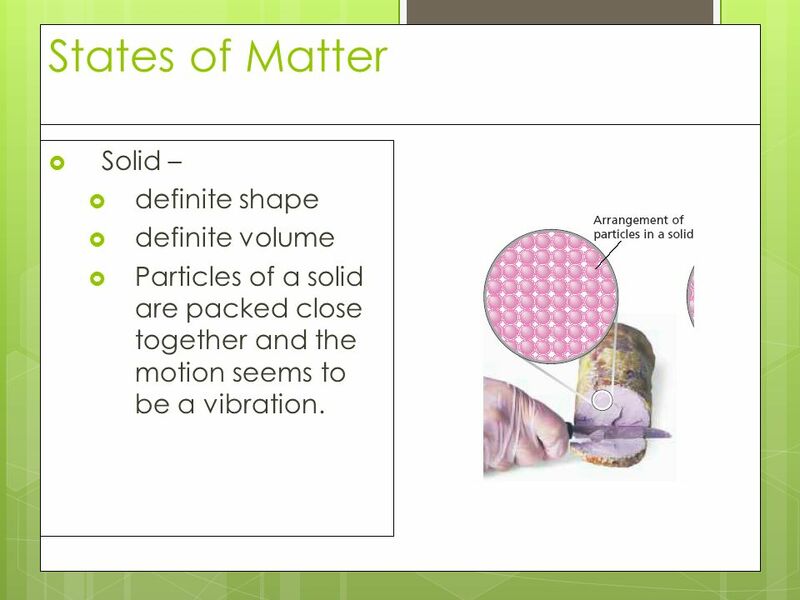 Solids Solid is a state of matter in which materials have a definite shape and a definite volume. Molecules/Atoms are tightly packed in a pattern and vibrate. 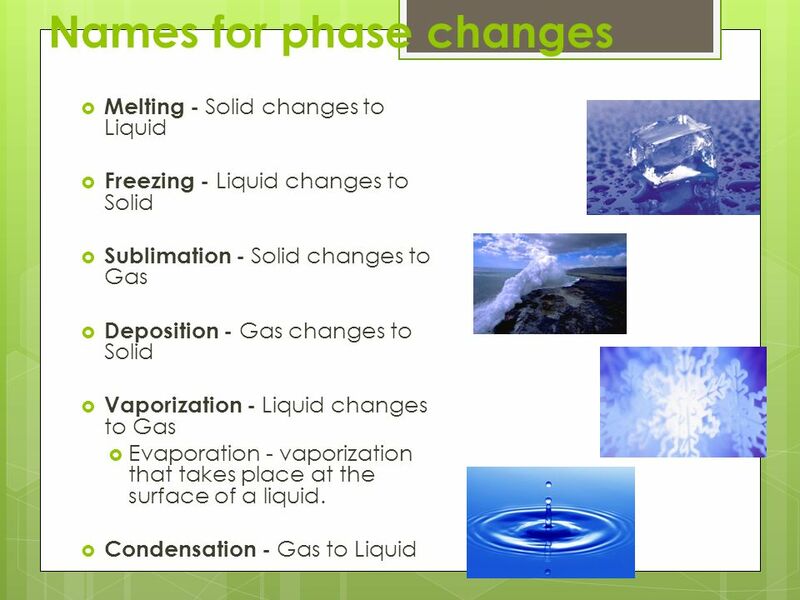 States of Matter Liquids and Gases 4.2 Liquids and Gases 4.2. Science 8 7.1: States of Matter. Objectives By the end of the next two lessons you should be able to:  Know what are matter and volume  State the Particle. 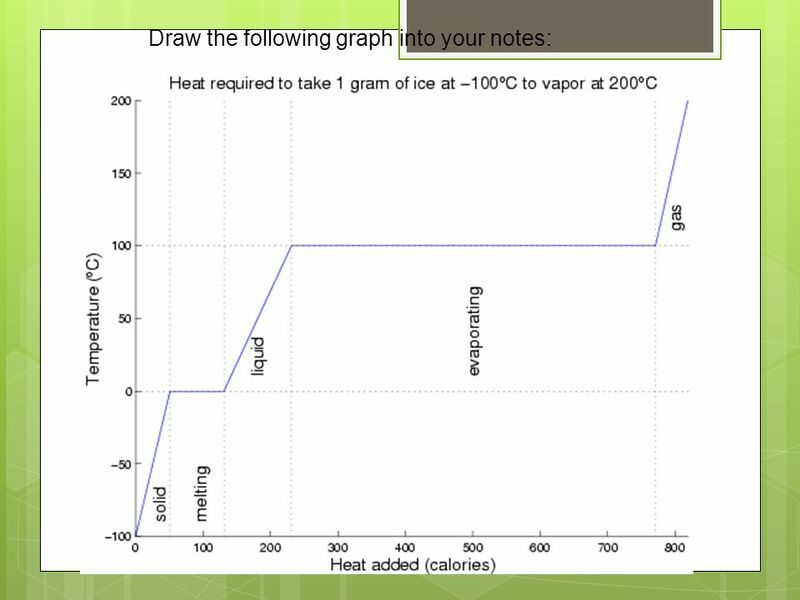 Unit 1 Lesson 5 States of Matter Copyright © Houghton Mifflin Harcourt Publishing Company.